Wondering what to do with your dog on Halloween? Halloween is a great time to spend with friends and family. You don’t have to be a kid or go to wild parties at the club to enjoy Halloween. Who better to spend that time with than one of the closest companions, your dog. Find a local cafe or brewery that has a dog-friendly porch. Usually, they provide bowls and even a few treats, but just in case, bring your own. Spend some time hanging out on the porch, enjoying a nice fall day, with your best friend. ● Scooby-Doo and anyone from Mystery, Inc.
know that their dog loves. often allowed. Make sure to contact the event before you bring your dog, just in case. Don’t forget a water bowl and a few treats for them to enjoy too! 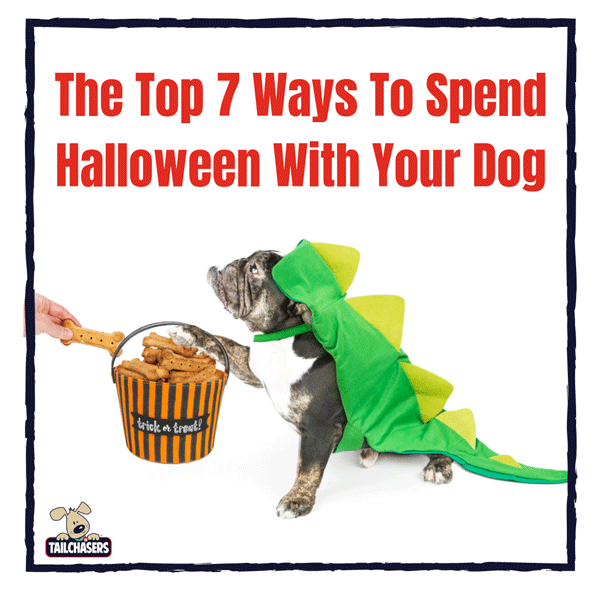 There are tons of fun things that you can do with your dog on Halloween, besides just trick or treating. Some dogs don’t mind the holiday, while others hate it. Either way, there is always something out there for you to do with them. What’s your favorite way to include your dog in your Halloween? Let us know some of the costumes or events you’ve done, we’d love to hear all about it!